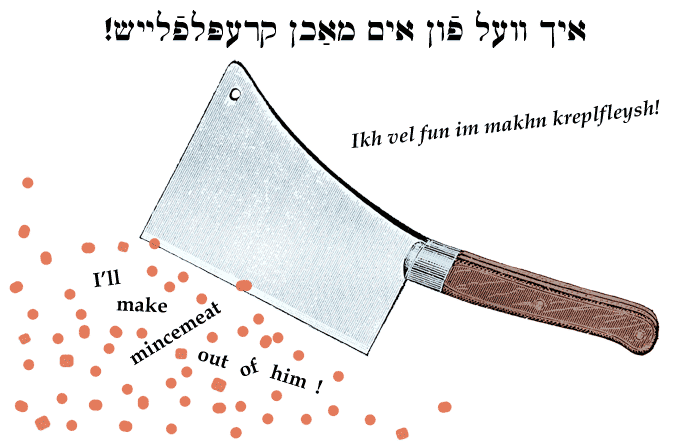 Yiddish Expression: I'll make mincemeat out of him! ‏‏איך וועל פֿון אים מאַכן קרעפּלפֿלייש! Ikh vel fun im makhn kreplfleysh! I'll make mincemeat out of him! SOURCE: Bernstein, Jüdische Sprichwörter und Redensarten. Kreplfleysh|קרעפּלפֿלייש refers to the finely chopped or ground meat used to fill kreplach (boiled dumplings with filling).